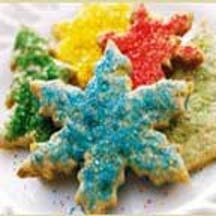 Festive, brightly colored Mexican sugar cookie cut-outs laden with salted pistachios, aromatic spices and zesty citrus flavor. In medium bowl, combine flour, baking powder, anise seeds, cinnamon, salt and pistachios; set aside. In large bowl, beat together butter and sugars with an electric mixer until light and fluffy. Add egg, extracts and zest; mix to combine. Gradually add flour mixture; mixing well. Divide dough in two pieces and place each piece on large sheet of plastic wrap. Flatten into 1/2-inch thick discs, wrap and refrigerate until firm enough to roll out, about 30 to 45 minutes. Roll dough out until 1/4-inch thick and cut into desired shapes. Place cookies on parchment-lined baking sheets. Decorate with colored sugars, if desired. Bake 9 to 11 minutes, until golden and crisp. Cool cookies on pan 3 to 4 minutes. Remove to wire rack to cool completely. Store in airtight container for up to 1 week. *Demerara and Turbinado are two types of raw sugar.